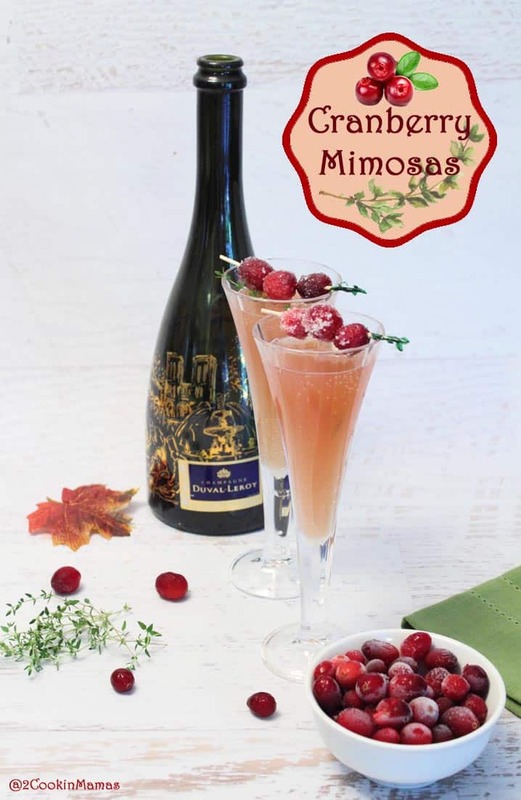 Our Cranberry Mimosas are slightly tart with just a hint of orange. 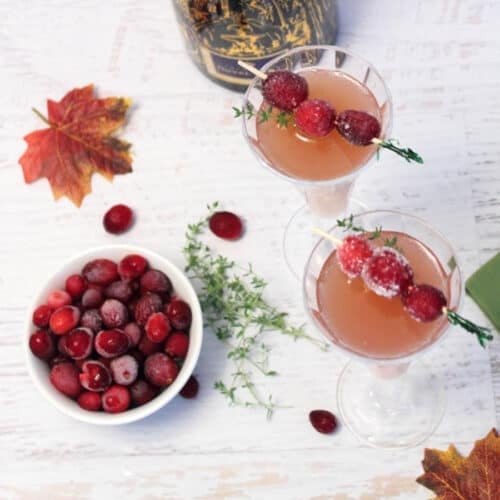 It’s an easy to make light cocktail with only 3 ingredients – champagne, cranberries & orange juice and an optional garnish of thyme. The perfect Christmas cocktail decked out in red & green. 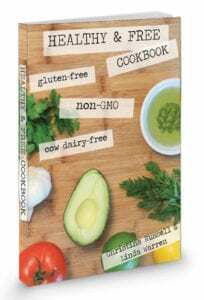 I took part in the Sunday Supper twitter party last Sunday evening and we were asked about any special foods/drinks we were going to prepare for Thanksgiving. Since my daughter is coming into town with her family I thought a special cocktail would be in order. 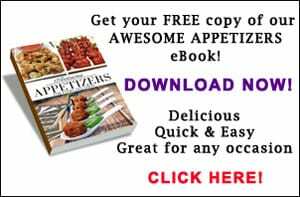 And, bonus, I could add it to our virtual Thanksgiving dinner, #blogsgivingdinner, that we’re sharing with our food blogger friends this week. I first got the idea for this cocktail because of a tradition we have in our house on Christmas morning. 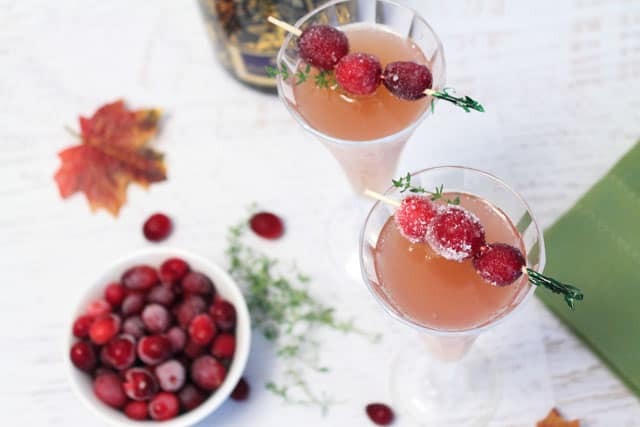 When our children became adults, we started making mimosas to sip as we opened our stocking gifts, so I thought why not make mimosas with something that is popular around Thanksgiving & Christmas, um, like cranberries – ding, ding, ding! 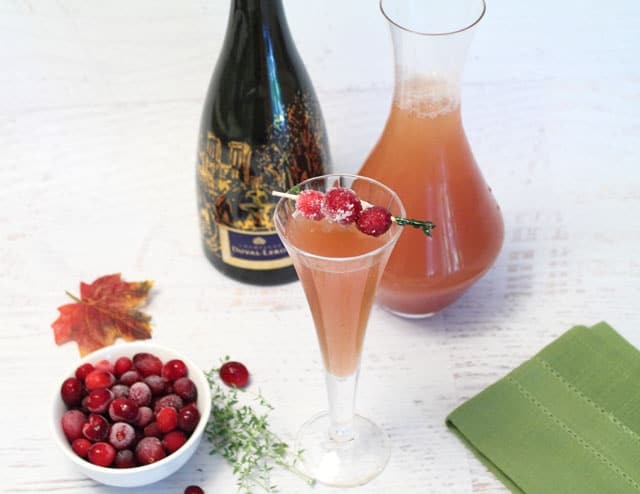 I had to make several test batches to get it just right, and you know that you can’t let champagne go to waste (picture happy face here), and found that I needed to add something sweet to the mix to make up for the tartness of the cranberries and the dryness of the champagne. I decided on adding a little orange juice to keep that ole pucker face away and, since I wanted it to look festive, used the actual cranberries for a colorful finishing touch. You could also add a sprig of thyme in the glass which, I must say, looks pretty classy or a slice of orange on the rim. 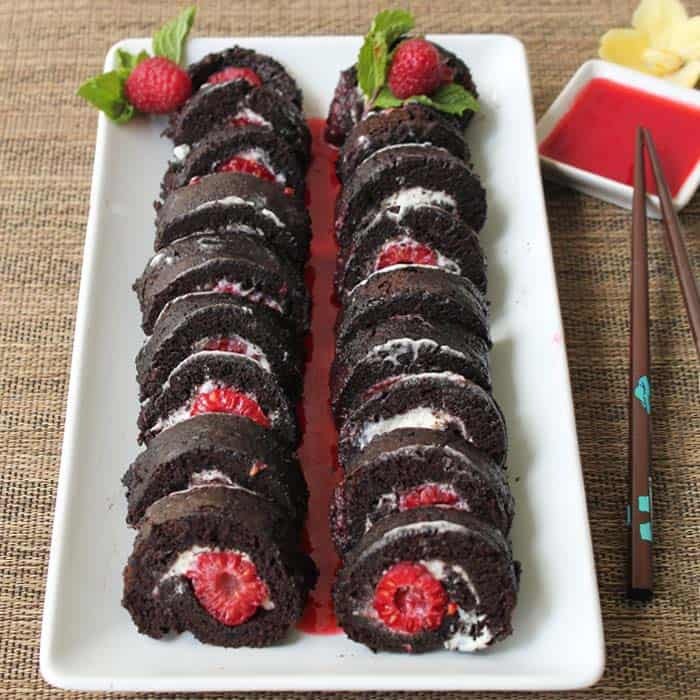 These mimoas were really, and I mean really, delicious (and by the way, I did share them with my hubby too) and I think they’ll be the perfect addition to our big holiday meal. By the way, don’t just have them for Thanksgiving, they are perfect for Christmas too! If y’all get a chance to try them, let me know what you think! 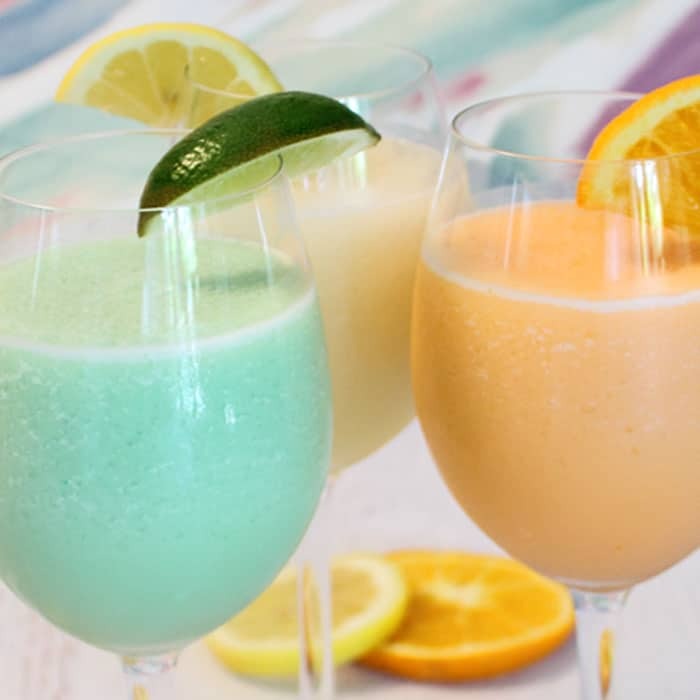 A slightly tart cocktail with just a hint of orange. 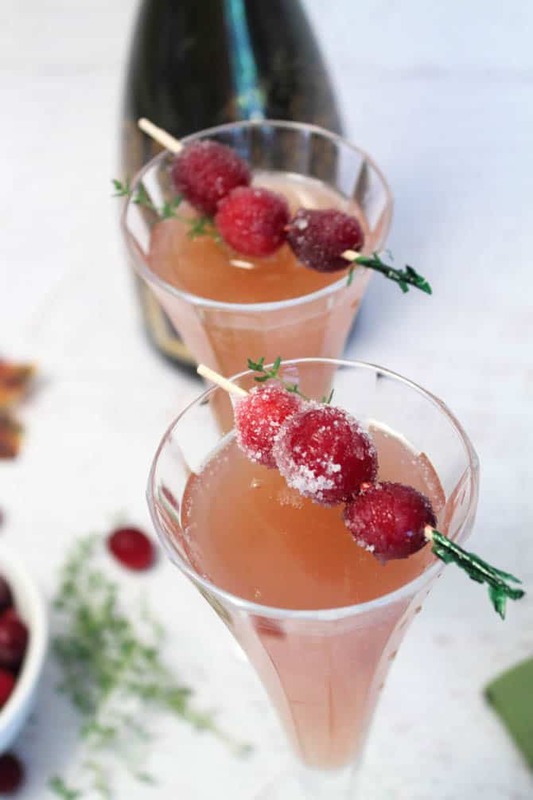 It’s so easy to make with only 3 ingredients - champagne, cranberries & orange juice. Decked out in red & green makes it perfect for the holidays. Fill champagne flute 1/2 way with champagne (about 1/2 cup). Add cranberry juice and orange juice. Stir lightly. Garnish with a few frozen sugared cranberries on a toothpick or an orange slice on the rim and a sprig of thyme (optional). 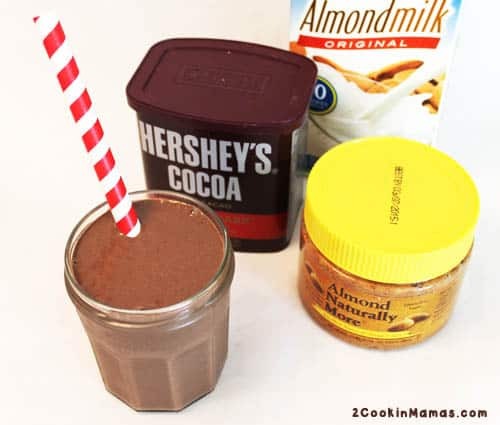 You can also make a pitcher just prior to serving to make it easier to serve a crowd. To make frozen sugared cranberry toothpicks: Remove a handful of cranberries from a bag of frozen cranberries and run under cold water. This should thaw them out enough to be able to stick a toothpick through them. Place 3 cranberries on each toothpick. Once you have them on the toothpicks, pour a small amount of sugar onto a plate & roll cranberries in sugar. 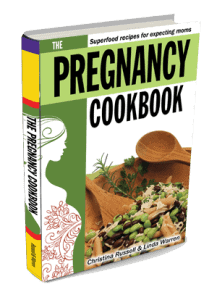 Place on a wax paper-lined cookie sheet and return to freezer until ready to use. Once frozen, they can be placed in a resealable plastic bag for easier storage. 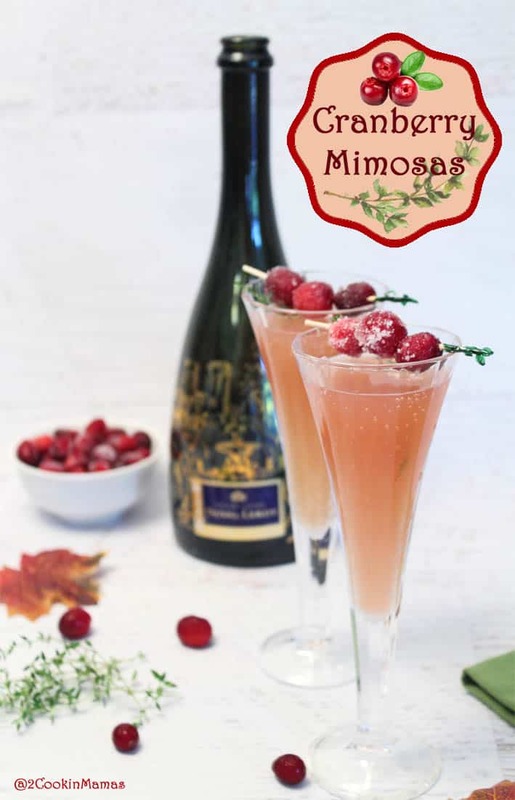 Cranberry mimosas sound perfect!! I love this.